Burbank, CA, April 5– See the unique story of three friends who became heroes when “The 15:17 to Paris” arrives on Blu-ray Combo Pack, DVD and 4K Digital. From Academy Award winning director* Clint Eastwood comes “The 15:17 to Paris,” which tells the real-life story of three men whose brave act turned them into heroes during a highspeed railway ride. The heroic trio is comprised of Anthony Sadler, Oregon National Guardsman Alek Skarlatos and U.S. Air Force Airman First Class Spencer Stone, who play themselves in the film. Starring alongside them are Jenna Fischer (“Hall Pass,” TV’s “The Office”), Judy Greer (“War for the Planet of the Apes”), Ray Corasani (TV’s upcoming “The Long Road Home”), PJ Byrne (“The Wolf of Wall Street”), Tony Hale (TV’s “Veep”) and Thomas Lennon (“Transformers: Age of Extinction”). Paul-Mikél Williams plays the younger Anthony, Bryce Gheisar plays the younger Alek and William Jennings plays the younger Spencer. Behind the scenes, the creative team includes frequent collaborators Tom Stern, who served as cinematographer on 13 of Eastwood’s previous films, and Deborah Hopper, who has served as Eastwood’s costume designer on 17 prior films, editor Blu Murray, who most recently cut “Sully,” and the film’s composer, Christian Jacob. Veteran art director Kevin Ishioka, whose work can be seen in “Sully” and in “Dunkirk,” serves as production designer. Warner Bros. Pictures presents, in association with Village Roadshow Pictures, a Malpaso production, “The 15:17 to Paris.” “The 15:17 to Paris” is distributed worldwide by Warner Bros. Pictures, a Warner Bros. Entertainment Company, and in select territories by Village Roadshow Pictures. “The 15:17 to Paris” will be available on Blu-ray Combo Pack for $35.99 and DVD for $28.98. The Blu-ray Combo Pack features a Blu-ray disc with the film in high definition, a Blu-ray disc with the special features in high definition, a DVD with the film in standard definition, and a Digital version of the movie. “The 15:17 to Paris” will also be available on Movies Anywhere. Using the free Movies Anywhere app and website, consumers can access all their eligible movies by connecting their Movies Anywhere account with their participating digital retailer accounts. 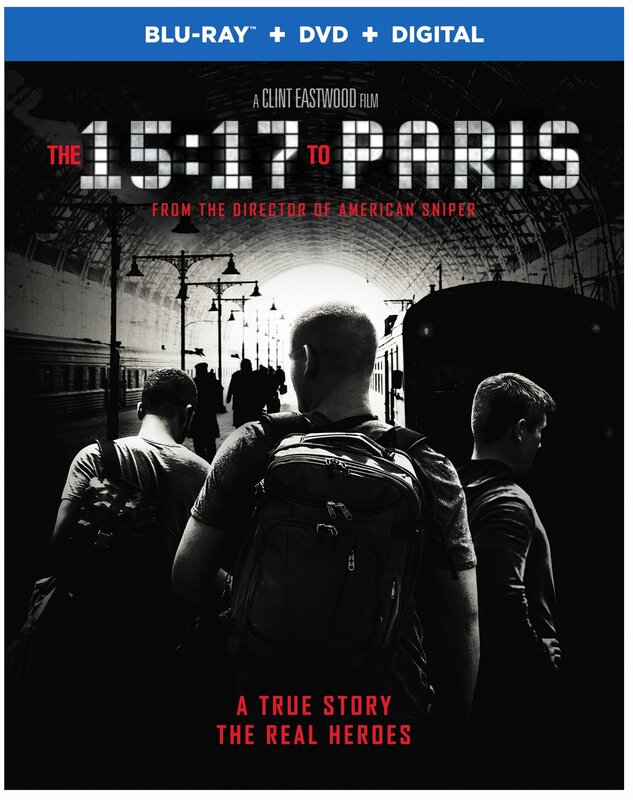 Fans can also own “The 15:17 to Paris” in 4K via purchase from digital retailers beginning May 1.
o Join Spencer Stone, Alek Skarlatos and Anthony Sadler – the three Americans who stopped the attack – as they take us moment-by-moment through the real-life drama, just as they lived it. o Join Oscar® winner Eastwood and his creative team as they reveal the aspects of the story that moved them and why they took the bold step of casting the three Americans to play themselves in the film. On May 1, “The 15:17 to Paris” will be available to own in 4K HDR from select digital retailers including iTunes, Google and Vudu. It will also be available in high definition and standard definition on favorite devices from select digital retailers including Amazon, FandangoNow, iTunes, PlayStation, Vudu, Xbox and others. On May 22, “The 15:17 to Paris” will be made available digitally on Video On Demand services from cable and satellite providers, and on select gaming consoles.